don’t represent historical facts but are part of the social and cultural identity of the men and women of Texas. They seek to entertain, to explain the mysterious, to warn the unfamiliar of possible dangers, and to preserve a section of life not found on the Internet or provable in a court of law. Like many legends, some of the stories the author has collected have multiple interpretations. However, this doesn’t lead to redundancy but to a fuller, more rounded telling of the tale, as each successive recounting builds on the previous story line. Strange tunnels, odd music, unfamiliar scents, often of something rotten … these are the details Turner employs to bring old haunting tales new life and vigor. They are told in a straight-forward manner, as if Grampa were holding court on the front porch, and selected photographs add credibility to the tales. After studying a few of these myths, readers will come away with a heightened sense of the abnormal and mysterious, as these legends will unsettle even the most stolid. 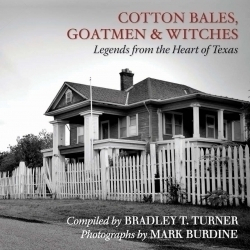 For those who like cryptic and unsettling tales, this selection of eerie stories from Texas will provide a delightful, albeit spine-chilling read.